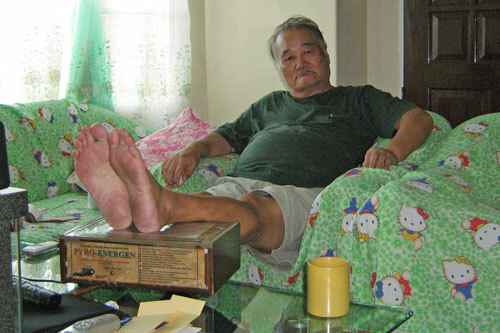 The PYRO-ENERGEN inventor, Mr. Junji Takano became a victim of tuberculosis when he was still a young boy. He started to look for ways and means to eradicate the disease in his body as well as those of his co-patients in the hospital. After World War II, there were only few medicines available in Japan. Some patients, including the inventor, did not get well in the hospital after so many months of treatment. He decided to research about the disease called tuberculosis. After many years of study, he discovered that there are three kinds of tuberculosis. One is caused by mycobacterium (tubercle bacillus) which is contagious. This is curable, if not, controllable by drugs. The second one is not caused by any bacillus, but by a certain force of energy wave—this is curable or controllable by PYRO-ENERGEN). The third one is caused by both. Patients suffering from the second and third kind of tuberculosis are not getting well by drugs, indicating that there is resistance against all kinds of drugs. X-ray results of such patients show positive tuberculosis spots in the lungs. However, if the sputum of such patients is placed into a laboratory test for cultivation of tubercle bacillus, it yields negative result. Hence, it should NOT be labeled as tuberculosis. In 1968, this discovery enabled the inventor to trace the origin of so-called incurable diseases and determine its eradication technique. It was then that the PYRO-ENERGEN was invented. A mysterious energy force of electrical wave is the denominator of all kinds of incurable diseases and produces cancer and virus. This force of energy wave is responsible for almost all diseases including cancer, kidney diseases, diabetes, tumors, asthma, arthritis, and many others. Have you ever heard that many patients who suffered from diseases got well after they got electrical shock or lightning? Electrical shock apparently made them well. Is there any connection between electrical shock and diseases? These events made the inventor understand the facts written in the religious scriptures that the illness is due to an outside negative energy force. Of course, there may be another miracle that can heal such diseases. You can simulate static electricity as shown below. The static electricity produced can help you maintain a healthy body and away from diseases. For this reason, almost all school students in Japan practice rubdown. Rubdown with a dry towel is one of easy way to produce static electricity and drive away the negative energy from the body. Do this rubdown motion several minutes a day. HISTORY: Skin rubdown using a dry towel to scrub the whole body is a Japanese traditional procedure since hundreds of years ago. Massage therapy is effective in improving cellular immunity, and skin rubdown also has similar effects. Our ancestors knew it before our modern medical technology surfaced. EXPERIMENTS: A study was conducted on sixteen bedridden old patients, who had suffered a cerebral stroke. Skin rubdown for about 10 minutes was added for 10 days. Blood was collected at noon on the day before skin rubdown, 5 and 10 days after initiation and 5 days after completion. The lymphocyte count, neutrophil count, serum gamma-globulin and C-reactive protein (CRP) levels and natural killer cell activity were also measured. In 9 of these 16 patients, B, T, CD4 and CD8 lymphocyte counts were additionally measured on the same days. RESULTS: There were no significant changes in the time course of the lymphocyte count, gamma-globulin or CRP levels. The neutrophil count increased 10 days after initiation of the skin rubdown, and natural killer cell activity increased 5 and 10 days after initiation, and returned to the baseline level 5 days after completion. Although there were no changes in the time course of the B, T, CD4 and CD8 lymphocyte counts, the CD4/CD8 ratio showed an increase 5 days after initiation and completion. CONCLUSIONS: Skin rubdown activates natural killer cells, which may be attributed to the effect of certain mediators released from the T lymphocytes or the stimulated effect on the sympathetic nerves. This technique may be used to reduce various complications caused by the decreased immunity observed in bedridden old patients. As shown on the above photos, Japanese pupils are rubbing with a dry towel with each other. This practice is done in most schools. You must do it as long as you want to keep yourself healthy every day. Short time trial of three days or so is ineffective at all. Rubdown with a dry towel on your body is the simplest way. However, after coming back from office and factory works, doing rubdown is too much of a hindrance. We want to rest and take a break. It would be great if you can eradicate diseases while resting, right? That is also one of the reasons why PYRO-ENERGEN was invented. The PYRO-ENERGEN electrostatic therapy machine can simulate skin rubdown but on a simpler and more effective and powerful manner! 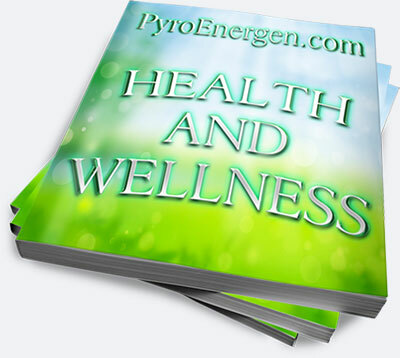 More than four decades had passed since the PYRO-ENERGEN was invented and started its production in 1968. During the humble beginnings, it was a difficult task to convince sick people to use the PYRO-ENERGEN for treating their diseases. Mr. Takano visited several universities and hospitals for the study of its effect, but no one lent him their ears. However, his continued visits made them try it for curiosity's sake. Several remarkable results appeared in cancer, leukemia, and diabetes cases. Many doctors around the world have begun to show interest in the machine. The photo above shows Mr. Takano, the inventor of PYRO-ENERGEN using a 40-year-old antique type of PYRO-ENERGEN up to now at his salon. This old machine has been serving the families of the PYRO-ENERGEN group until now, although some repairs or modifications were made to it. The machine saved hundreds of people's lives just within the PYRO-ENERGEN family group. Yes, it's true. 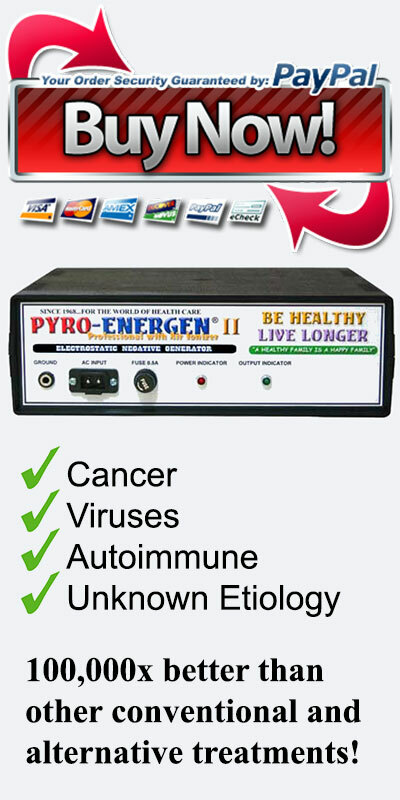 The PYRO-ENERGEN may save your life, as well as your money!